Of late, land has increasingly been figuring into the development sector, for both positive and negative reasons. Land rights champions, in particular, as well as development communities in general, are now seeing the signs of a global land rights revolution brewing. 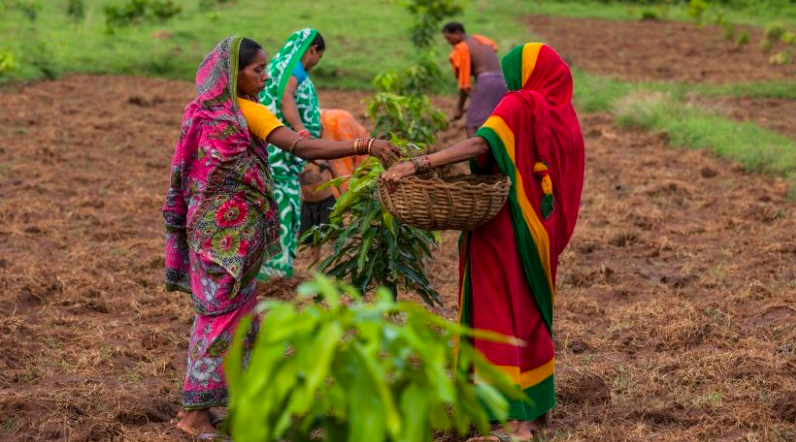 More inclusive development is now possible, with new hope of improving land records of excluded communities or rebooting green revolutions with women's land rights. or for that matter acknowledging and furthering the rights of indigenous communities for more effective conservation. In India, land is back on the development agenda, after the land-reform waves in post-independent decades, with Forest Rights (FRA, 2006), Fair Compensation Rights (LARR, 2013), Land leasing reforms, Women inheritance Rights (HSA Amendments, 2005) and a revamped DILRMP, all underlining and reiterating the development connection. This growing acknowledgement at global and local levels, is evident with a number of SDG targets and indicators including land concerns. Interestingly, this has also lead to centre staging of land in contemporary development considerations in policy, practice and investments. The India Land and Development Conference, is an attempt to substantiate and strengthen these linkages between land and development, by encouraging inclusive conversations and increased connection between participants. While it draws inspiration and learning from the World Bank’s Land and Poverty Conference, it has been conceptualized and will unfold quite differently, adapting to regional realities and contexts. The ILDC hopes to be much more than a mere conference, limited to the boundaries of time, pre-designated topics, and pre-identified targets. This blog is an attempt to provide a snapshot into the ILDC. The idea is not only to have readers familiarize themselves with the ILDC, but also to generate more interest, be able to answers questions and encourage further participation! 1) What is the ILDC? The India Land and Development Conference (ILDC), is a unique annual land platform ,which attempts to encourage innovative and effective contributions towards inclusive land governance and land tenure security in India for sustainable development. A first of its kind initiative, the ILDC is the only national event concerning land and development in India. India is not only the biggest democracy and the world’s second most populous country, in terms of land governance; it is also one of the most complex, with a very long history and highly pluralistic tenure regimes. While India is quite advanced in terms of technological use and innovation in land administration, it is also home to a substantial number of poor and landless while a majority of its judicial disputes are around land. Its ambitious growth trajectory has been ridden with stories of land conflicts and exclusion. More information and updates on the ILDC can be found at: http:/centerforland.org/ildc2019/. 2) Why the ILDC? What does it aim to change or impact? Making land governance inclusive is imperative to ensuring and sustaining India's development needs. The Indian land ecosystem being characterized by administrative siloes, geographical vastness, socio-cultural diversity as well as sectoral fragmentation and actors-isolation, means that swift communication and coordination are needed on these matters. The ILDC, as an open platform, hopes to connect intra and inter-sectoral and multi-level actors and stakeholders and trigger inter-disciplinary land-dialogue. The hope is that this will help in changing conversations and contributing to improved cohesion and a well functioning land-ecosystem. Evidence highlights that synergistic impacts from reduced duplication to increased cross learning emerge from such shared spaces. With increasing polarization around land-debates, the ILDC offers an opportunity to bridge divides, generating scope for cooperation and better streamlining resources to impact the change we seek. Catalysing coordinated and impactful research, innovations, advocacy and actions. In terms of outcomes, the ILDC seeks to change and amplify narratives, gather evidence for policy and practice, trigger networks and alliances, fertilize knowledge management and convene action, and contribute to the larger goals of inclusive land governance and sustainable development. 3) How is this conference different? How does it stand out? It is the only microcosm to learn and experience the pulses of land-initiatives, engagements and innovations such a large and vast country like India, at one place, in just over three days. 4) Who should attend the ILDC? The ILDC is a celebration of all those working in the land sector, in whatever capacity, and their partnerships. The conference is geared towards them and their institutions. It is open to people and institutions working on and related to the interface of land and development in India. They converge at the ILDC to share their work, learn from others, connect and network, build and amplify narratives and further discourses, research and action. 5) What about this year’s event? Four thematic areas define the focus of the ILDC 2019. These include (1) Partnership for Improved Land Governance, (2) ‘Inclusion’ of Excluded Land Rights, (3) Impact' with Land Data & Evidences and (4) Transcending Boundaries & Deepening Conversations. Accordingly for sessions and deliberations the ILDC 2019 has delineated six broad themes encompassing wide-ranging sub-themes and sessions to provide space to diverse land engagements and experiences on-going in India. The ILDC 2019 expects to have more than 30 partners contributing to its organization directly as co-organizers, knowledge-partners, media-partners and sponsors, each with clearly defined roles and responsibilities as well as benefits. The ILDC 2019 will have diverse events to share, learn and network with wide scope of interaction, levels of engagements and opportunities for deliberations. In addition to providing usual conference opportunities for furthering learning and sharing, ILDC2019, being a multi-stakeholder platform, will attempt to converge and connect conversations and take them to next logical steps by connecting them to appropriate policy, practice and research stakeholders at regional, national and international level. Types of eventsplanned include (1) Plenaries: Inaugural, Open Space, Valedictory (2) Parallel sessions for papers, panels and special deliberations (3) Innovation Fair (4) Master Class (5) Networking events/space and (6) pre and post-Conference events viz. Webinars, Campaigns and Workshop organized in virtual and physical space. As the ILDC moves through various editions, increased learning and new partnerships, we realize that each iteration Is a small step in the journey towards inclusive land tenure security and sustainable development. We welcome you to participate and contribute!